Vacancies in 20 Government Banks branches located all over India for available 4102 vacancies. Currently in this recruitment vacancies are available in 09 Govt Banks only. Those who are interested to became a banker with high pay scale those are welcome to apply for these vacancies. Only online applications are allowed to for this Probationary officer/Management Trainee's recruitment of IBPS. 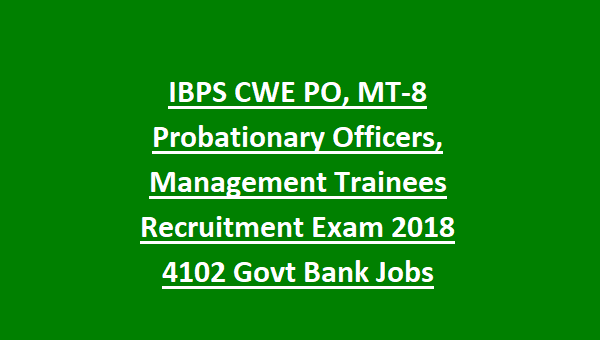 There are total 4102 vacancies are available in this IBPS CWE PO/MT 2018 for the vacancies of year 2019-2020. The eligible candidates have to submit the application online only via the official website of IBPS @ibps.in on or before 05-09-2018. Selection for this IBPS PO/MTs recruitment will be held based on Preliminary and Mains Examination and Interview. 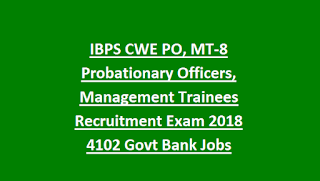 For more information regarding this IBPS CWE PO/MTs Jobs Recruitment Exam 2018 of please see the below given details. Click here for detailed advertisement for IBPS CWE PO-MT 8 recruitment examination. There are total 4102 vacancies available in this current recruitment of IBPS Probationary Officers. Available posts and vacancies details are given below. For SC/ST 5 years, for OBC candidate's age relaxation is 3 years. Any bachelor's degree from a recognized university. Pay scale may vary for each bank. For the candidates of General, OBC application fees is Rs.600/- and for the SC/ST/PWD candidates Rs.100/-. The candidates have to pay amount online payment only via the credit/debit card or net banking. Selection for this IBPS Recruitment will be held in 3 stages. Phase 1: Prelims Examination will be conducted for 100 marks with 100 questions with 1 hour duration. Those who are qualified the prelims examination they are only called for the mains examination. Phase 2: Mains Examination having two tests. a) Objective Type Test will be conducted for 200 marks with 140 Minutes duration. The eligible candidates have to login to the official website of IBPS and choose the priority of banks and apply for the posts of PO or MT. Upload the signatures Image and Photo Image. On successful completion of application submission please take a printout of completed application and fee payment confirmation. Click here to apply online for the recruitment of IBPS Management Trainee/Probationary Officers. Click here to see the official notification for IBPS PO Recruitment 2018.